The ages of three to six are an important part of a young child’s development. They’re growing quickly and setting the foundation for a lifetime of learning. 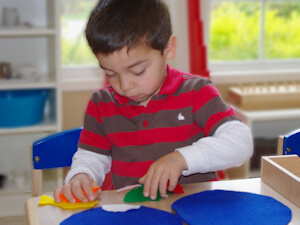 Aster Montessori nurtures young children by supporting their educational journey in a unique Montessori environment. All children develop at their own pace. Our preschool program nurtures these three to six-year-olds in a mixed age classroom to foster their strengths and provide support in areas that need improvement. A social group with varying ages offers distinctive benefits to children in each stage. The younger children can learn and ask for help from older peers. Older children have the opportunity to model behavior and abilities for their younger peers. All ages feel accomplished and successful by sharing their individual strengths, and encouraging their peers by fostering emerging skills. Our experienced teachers here at Aster Montessori support each child in their learning journey. Through attentive observation and planning, they focus on supporting each child’s path to success. By cultivating a classroom atmosphere that is naturally joyful, peaceful, and organized, our teachers help and encourage the children in their efforts. This allows children to develop meaningful self-confidence and self-regulation. Our small class sizes enable our teachers to provide individual attention to each child. With fewer students, the classroom becomes a community of learning and cooperation. The children feel free to share ideas and express opinions. Aster Montessori ‘s smaller class sizes also provide more opportunity for each child to communicate and contribute to projects, and take part in spontaneous interactions with their peers and teachers. Here at Aster Montessori, our classroom is exclusively designed to meet and nurture the educational and social needs of young children. Our classrooms feature prepared environments that serve to promote and support your child’s natural curiosity. The Practical Life Area promotes exercises and activities so your child can learn living activities in a purposeful way. These exercises are inspired by everyday actions. From the ages of three to six, your child is developing a sense of inner person. It’s important for children at this age to participate in activities that prepare them for their environment, allow them to grow independently, and develop their fine and gross motor skills. The area is designed to help the development of task organization and cognitive order through care of self and others, care of the environment, exercises of courtesy, and coordination of physical movement. Children learn to be respectful towards work, other children, and the teacher. Activities are targeted towards refining each child’s concentration, coordination, independence, and sense of order. The Sensorial Education Area promotes your child’s learning through the senses: sight, smell, hearing, taste, and touch. The goal of sensorial work in our classroom is to provide your child with a logical way to collect and understand information about the world around them. Based on those experiences, they can become a “sensorial explorer”. All learning first comes to us through the senses. At Aster Montessori, these senses are isolated for learning by using specific material designed to develop a particular sense. The Sensorial Area enables children to order, classify, and describe sensory impressions in relation to elements such as length, width, temperature, mass, color, and pitch. 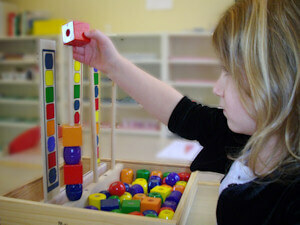 The Mathematics Area introduces your child to basic math and nurtures their abilities toward more advanced concepts. In our classrooms, preschool math provides your child with the academic building blocks to know the real-world meaning behind the numbers. The child-focused approach of this area allows the children to explore math holistically to foster a deep sense of understanding. The Mathematics Area of our classroom makes use of manipulative materials to enable the children to internalize concepts of number, symbol, sequence, operations, and memorization of basic facts, in a unique way from simple to complex (concrete to abstract). 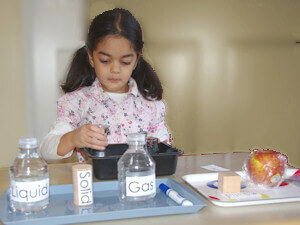 Children develop a solid foundation by repeating the concepts through different activities and materials. It prepares them for solving problems that are more complex in further stages. Our educational material is designed specifically to make learning math a fun activity. The Language Development Area encourages your child in their spoken language, reading, writing, and grammar. Children who learn to become articulate in thinking, writing, and speaking are better able to experience, share, and express their ideas in and outside of school. Basic skills in writing and reading are developed in our programs using sandpaper letters, alphabet cutouts, and various presentations. This allows children to link sounds and letter symbols effortlessly and to express their thoughts through writing. We teach language skills through gradual steps making sure the basics of each step are understood. Steps include vocabulary enrichment, phonics, reading, writing, and basic grammar. The Cultural Activities Area promotes your child’s learning of local and global cultures and societies. As one the first generations of 21st century, growing and learning about the world helps today’s child become “cultured” and knowledgeable about the world they are growing up in. The activities in this area of our classrooms expose the children to the basics of geography, history, and life sciences. Geography includes physical and social geography concepts. The Science Area stimulates your child’s young mind to explore and discover scientific concepts in a wide variety of fields through investigation. In this area, your child will not just learn about science, but learn through science as an extension of their everyday world. They will wonder, discover, and explore it in a way that is instinctive and fun. We introduce children to basic concepts in botany, zoology, chemistry, and physics, with simple experiments. We emphasize understanding of environmental concerns by introducing ecology and our role as citizens of the Earth. At Aster Montessori, our classroom curriculum also includes a variety of different guided activities to nurture your child’s learning. Young children have the opportunity to explore and discover more about their world through various creative methods such as finger painting, crayons, and clay. We support children’s growth and development through early experiences with music. Introduced early, music experiences can support a children’s development in areas like science and math, literature and cooperation. Yoga is an important element of our curriculum at Aster Montessori because it serves as an excellent way to help little ones to connect with their mind, body, and inner self. We incorporate weekly Spanish lessons into our curriculum because young minds thrive when they learn new languages early on, and Spanish is a popular language worldwide. For a child, no day is complete without an opportunity to run, play, and release some energy. We include both physical education and gross motor exercise in our curriculum to help little ones build strong bodies, improve balance and hand-eye-coordination. Examples include running, throwing, and swinging. Outdoor learning lets us bring learning outdoors. We help the children enjoy and learn outdoors by mixing education and fun. The children investigate nature through experience: looking at leaves, trees, and plants. We encourage the children through physical activities by providing a variety of different ways for them to run and play. Our outdoor play area is based on natural playground concept. We want to serve your child as a learning-focused extension of your family. We provide many opportunities for you to be a part of your child’s learning experience. This includes opportunities like volunteering to read, and participating in school activities. These activities include art docent, gardening, field trip volunteering, and joining the classroom to share unique cultures and home experiences. We support our children’s growing understanding of libraries and early research methods through the Mobile Library Program. This library van visits the school monthly to provide the children with the experience of a selecting, borrowing, and returning a library book. At Aster Montessori, we celebrate a variety of national and cultural holidays and events. Celebrating national holidays like Mother’s Day, Father’s Day, and Thanksgiving give young children a way to connect familiar celebrations with their in-school learning environment. World holidays are wonderful opportunities to teach children about different cultures and traditions. Aster Montessori families also enjoy school events as well, such as our Year-end Potluck Party. To provide a strong foundation in the areas of social, emotional and academic development; depending on each child’s ability. Provide one-on-one attention to refine math skills e.g. Operations and algebraic thinking like concept of addition, subtraction, multiplication, division and fraction depending on child’s ability. We also introduce hands -on science experiments, technology and basic engineering concepts. Your child needs to be 5 years old by August, 31st to enroll for kindergarten. Aster Montessori is verified by the Pacific Northwest Montessori Association (PNMA), a Montessori education association that establishes trueness to the Montessori method and continued program excellence. All teachers, including the director, are certified by the American Montessori Society (AMS). We uphold the highest standards of Montessori education with worldwide recognition of the quality of our program. All our teachers have minimum bachelor degree with several years’ experience in teaching young children.